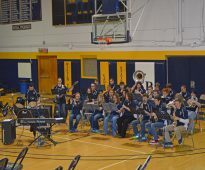 The William Penn University Athletic Bands are a great opportunity for music majors and non-music majors alike. With a variety of ensembles, we want to give students a way to enhance their educational experience. Scholarships are available for participating students. 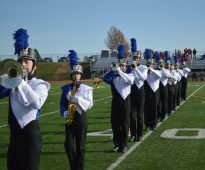 If an Athletic Band scholarship is awarded, a student must participate in marching band and at least one other ensemble. These groups include Pep Band, Winter Percussion Line, and/or Color Guard. Click to fill out our Athletic Bands Questionnaire. This information will help Terry DeJong, Director of Athletic Bands, and you determine where you will fit the best in the WPU Athletic Bands program. We give students the opportunity to participate in a program similar to their competitive high school programs, to perform at a higher level of proficiency, while keeping the overall focus on their higher educational studies. The Pep Band performs at home athletic events and has attended national athletic tournaments if a WPU team is participating. The band also performs in some university and local events such as the Dean’s Convection. 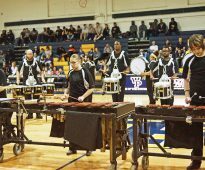 The WPU Winter Percussion Line has been active for the past seven years. This is an opportunity for our percussion members to stay active and enjoy marching and concert style percussion performances during the Winter/Spring semester. During the Fall and Spring semesters the color guard performs half time exhibition performances and in community parades. 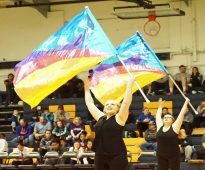 There are participation scholarships available specifically for color guard “only” students who would like to join winter color guard and marching band.